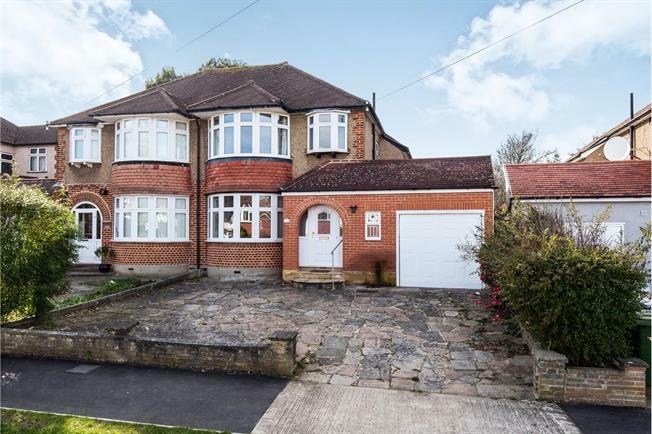 3 Bedroom Semi Detached House For Sale in Worcester Park for Asking Price £600,000. NO FORWARD CHAIN. A three bedroom family home just half a mile from Worcester Park's Zone 4 station and offering the purchaser the opportunity to create a home to their own taste and specification. The property has had the kitchen extended but has potential to extend further subject to the usual planning consents. The ground floor has plenty of entertaining space with two reception rooms and a conservatory. A shower room and WC complete the ground floor. The first floor has three double bedrooms all with built in wardrobes and there is a family bathroom with a separate WC. The rear garden is mostly laid to lawn and is west facing. And the property further benefits from off street parking and a side garage. Edenfield Gardens is a popular residential road with a number of well regarded local schools in the area and within close proximity of the open spaces of Shadbolt Park. Worcester Park has a busy and vibrant high street benefiting from a Waitrose, Sainsbury's Local and a great selection of coffee shops, bars and restaurants. Buses serve Kingston, New Malden and Sutton and the A3 provides access by road to London and the south.